AN American (Cris Copas of Kentucky) and his partner from Mindanao (Claude Bautista of the CPB group) may have snagged the solo championship at the World Slasher Cup first edition last February, but those angling to win the coveted silver-plated WSC cup will have a second chance this year. Shown here are (from left) Miss Intercontinental 2018 Karen Gallman, Miss International 2018 First Runner-up Ahtisa Manalo, Binibining Pilipinas Supranational 2018 Jehza Huelar, Claude Bautista’s representatives Cesar Tan and Alejandro Jochico, Uniprom Inc COO Irene Jose, and WSC Derby Office head Dong Lamoste. On May 27, the 2019 World Slasher Cup 2 kicks off at the historic Smart Araneta Coliseum and will last until June 2. WSC 1 champs CPB and Cris took the solo championship early this year by fielding their fiercest Kelsos, Roundheads and Sweaters. The entry owned by Bautista, a former WSC champ, and first time WSC winner Copas scored a perfect 9-0 card for the win. The hard feat was nearly challenged by Team Alcala with 8 points for their Birthday Gift 1 and 2 entries to score a runner-up finish. Following closely behind were Belle Almojera of Florida, and Santi Sierra of Cebu with 7.5 points. Those who finished with 7 points were former champs Nene Araneta, Biboy Enriquez, and cockfight idol Patrick Antonio – whose win last year gave him a total of 7 championship trophies; and WSC loyals Jomel Gatlabayan and RGBA Friends, Jimmy Junsay, Doc Marvin Rocafort, and Cris/Paolo Mercado. 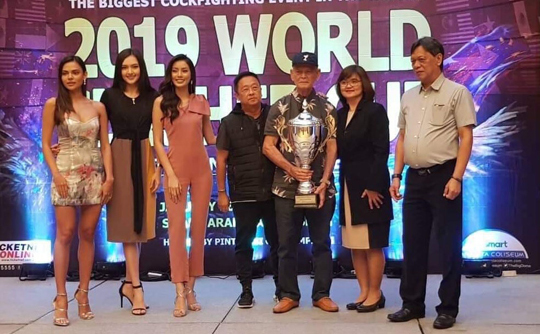 Winning at the World Slasher Cup is still a dream for many ardent cockfighting enthusiasts not just in the Philippines but from abroad as well. Marty Bentley and Brett McCormick from Ohio, who had travelled to the Philippines twice before to check out the WSC, competed for the first time last January with their Roundhead Albany Crosses and Kelsos. “We loved it that’s why we’re back,” said Bentley. “It’s something we’ve always wanted to do,” he added about competing. Participants can register their entries as early as now via the World Slasher Cup official website www.worldslashercup.ph; or through the Derby Office via 588-4000 local 8227, or 911-2928. Hennies are not allowed in WSC.